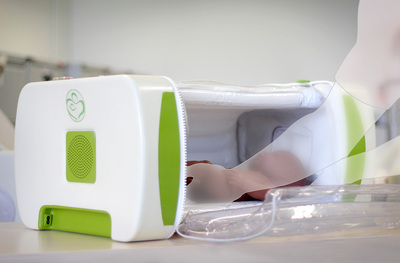 The mOm Incubator is a collapsible infant incubator that is being designed to provide a level of thermoregulation that meets the standards set for conventional incubators. In other words, it will provide a regulated environment that will keep babies warm as well as the incubators that you would find in well-equipped neonatal intensive care (NICU) wards. The mOm Incubator can be used in conjunction with Kangaroo Mother Care (or skin-to-skin) to help keep hypothermic babies warm. James created mOm after watching a documentary on Syria where he learned that as a result of the stress of war, infant mortality rates have soared causing the country to lose nearly an entire generation to preventable infant deaths. He saw this as an opportunity to make a difference and invented mOm as part of his Design Engineering course at Loughborough University where he went on to win the Sir James Dyson Global Prize for Innovation in 2014. For more watch this interview James did with CBS News. mOm involves an extended team of experts in engineering and medical design as well as a number of neonatologists, midwives, nurses and other clinical specialists. mOm is patient and user centric and it is only by intimately understanding clinical workflows and user preferences that mOm can be designed to be the most optimal solution for infant warming. mOm is the only known compact and low-cost solution that provides an enclosed micro environment similar to a conventional incubator. This is important to ensure a higher degree of thermoregulation and minimise the risk of infection to the baby. An incubator is a piece of medical equipment that is used to maintain environmental conditions suitable for a neonate (newborn baby). It is used in premature births or for some ill full-term babies that become hypothermic. The primary function of an incubator is to regulate temperature and keep babies warm. Where can mOm be used? The genius of mOm is that it’s designed to be used anywhere. From rugged, harsh environments in rural Africa to time-sensitive neonatal transport in the developed world and everywhere in-between, mOm provides high quality, durable design to service the most challenging settings. Learn more about what makes mOm different. How can I purchase mOm? mOm is currently in development. In the meantime, mOm is building a global distribution network. If you would like to distribute mOm in your region or would like to purchase mOm when it becomes available, please contact us. Is mOm a regulated medical device? mOm will initially be regulated as a medical device in Europe with a CE Mark as a Class IIb device. Further regional approvals will be sought thereafter. What does mOm stand for? Although mOm is not an acronym, we hope it will soon be a brand synonymous with increasing access to quality healthcare around the world. Can mOm keep you up to date with newsletters and marketing material? Thank you for your interest in mOm! Watch this space for the first locations where mOm will be available.